Salsa Ala Carte Ti 2010 - 2011 derailleur hanger 6061 T651, made with CNC technology. Black anodized. Lighter and more durable than the hanger series. Salsa Beargrease 2013 derailleur hanger 6061 T651, made with CNC technology. Black anodized. Lighter and more durable than the hanger series. Salsa Colossal 2013 derailleur hanger 6061 T651, made with CNC technology. Black anodized. Lighter and more durable than the hanger series. Salsa Colossal Ti 2013 derailleur hanger 6061 T651, made with CNC technology. Black anodized. Lighter and more durable than the hanger series. Salsa Fargo 2011 - 2013 derailleur hanger 6061 T651, made with CNC technology. Black anodized. Lighter and more durable than the hanger series. Salsa Fargo Ti 2011 - 2013 derailleur hanger 6061 T651, made with CNC technology. Black anodized. Lighter and more durable than the hanger series. Salsa Juan Solo 2005 derailleur hanger 6061 T651, made with CNC technology. Black anodized. Lighter and more durable than the hanger series. Salsa Mamasita 2008 - 2010 derailleur hanger 6061 T651, made with CNC technology. Black anodized. Lighter and more durable than the hanger series. 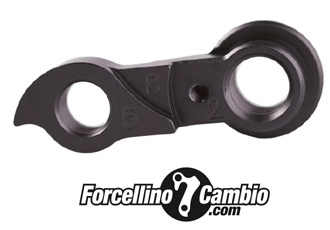 Salsa Maxle aka fs2315 derailleur hanger 6061 T651, made with CNC technology. Black anodized. Lighter and more durable than the hanger series.